Jim has over 20 years of experience working with professional, competitive, and recreational athletes as well as non-athletes who are experiencing pain or limitation of movement. 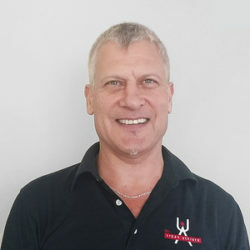 His practice includes RMT (Registered Massage Therapist), FST (Level 2 Fascial Stretch Therapy), Tui Na (Chinese Massage), Chinese Cupping and Strength training as a means to get you past whatever injury or instability you may have. After winding down his own competitive career in combative ring sports and distance running, Jim went on to coach The Canadian National K1 Team 2009-2014 and now works with individual athletes on enhancing performance, and injury prevention. Jim likes long walks on the beach, kitchen food experiments (disasters), travel and is now hooked on mountain biking. Jim is based at our Bloor West location.